The first violin part for Strauss' Orchestersuite der Bürger als Edelmann (Le bourgeios gentilhomme), Op. 60 has been edited by Ilya Kaler, who has appeared as guest concertmaster with the San Francisco Symphony, Philadelphia Orchestra and Baltimore Symphony. Kaler's bowings, fingerings and other editorial markings have been added throughout the score. Der Bürger als Edelmann (Le bourgeios gentilhomme) is an orchestral suite written by Richard Strauss between 1911 and 1917, based on Molière's 1670 play. Originally a combination of play and opera by Hugo von Hofmannsthal and Strauss, it was later separated. Strauss provided incidental music to Hofmannsthal's final version of the play and also created an orchestral suite from most of the music. The complete suite is comprised of 9 movements and takes about an hour to perform. 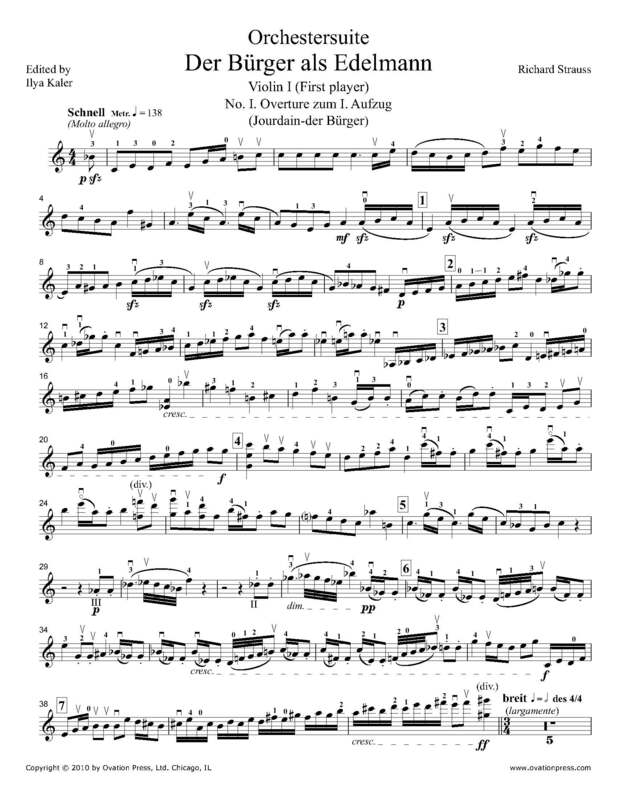 Download and print the score today to gain access to expertly edited Strauss Orchestersuite der Bürger als Edelmann violin fingerings and bowings from Ilya Kaler!